Probably, you are reading this review looking for a 12 bottle wine cooler. 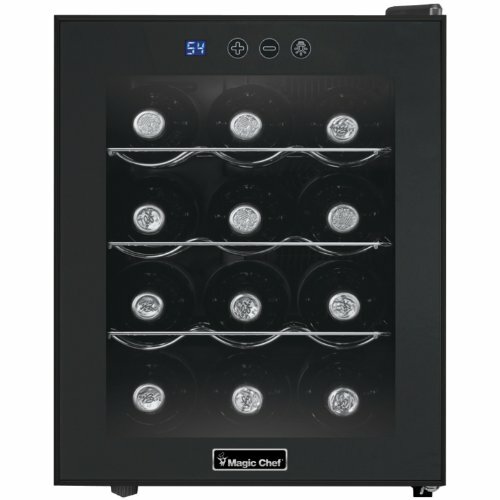 The Magic Chef MCWC12B is an excellent entry level wine refrigerator. First of all, the electronic temperature controller ranges from 54-66 °F. Easily adjust the set temperature by using the plus or minus buttons on the front of the unit. Additionally, this model features thermoelectric cooling technology. So, this means the appliance runs vibration free and quietly. However, thermoelectric cooling wine coolers are dependent on the ambient air temperature. As a result, there are instances the wine cabinet will be unable to reach the set temperature. Yet, an ambient temperature of 77°F will allow the unit to cool all the way down to 54°F. So, unless you are planning to place the wine cooler in a very warm location (over 77 degrees) you will be able to achieve the temperature settings of your choice. Due to the minimum temperature of 54 degrees, we feel this wine cooler is a great fit for all red wine in addition to a mixture of both red and white wine. We recommend looking at other wine cooler models for those wishing to buy a cooler to store only white wine. Most of all, if you are limited on space – don’t worry! This Magic Chef wine cooler is only 14.2″ W x 19″ T x 20.1″ D. With a weight of only 26.4 lbs., it is also easy to move around the house until you find the perfect location for it. 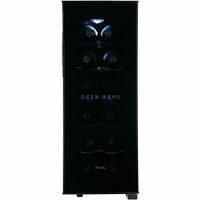 In conclusion, this wine cooler will fit the needs of most people looking for an entry level wine cooler. Option to engrave with the initial and four-digit year of your choice. Holds any standard sized wine or liquor bottle. Comes packaged in a chic paper carrying case. Wine cooler measures 4.25 x 4.25 x 15.25 . Customized with the initial and name of your choice. Crafted from sturdy black marble. Great housewarming or wedding gift. Measures 6 x 4 and can hold any standard 750 ml bottle. Overall, the Magic Chef MCWC12B is an excellent choice. 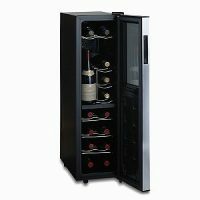 This wine cooler is the perfect fit for novice wine drinkers only needing to store up to 12 bottles of wine. The perfect entry level 12 bottle wine cooler. In the event of a power failure, temperature settings will be lost. Lowest temperature setting of 54. Depending on your preferences, this may not be cool enough if you only store white wine.